The Vashon Allied Arts retail gallery, the Heron's Nest, is reopening after an extensive remodel April 5th and on Vashon's First Friday Art Walk. Earlier today I dropped off art and art cards. 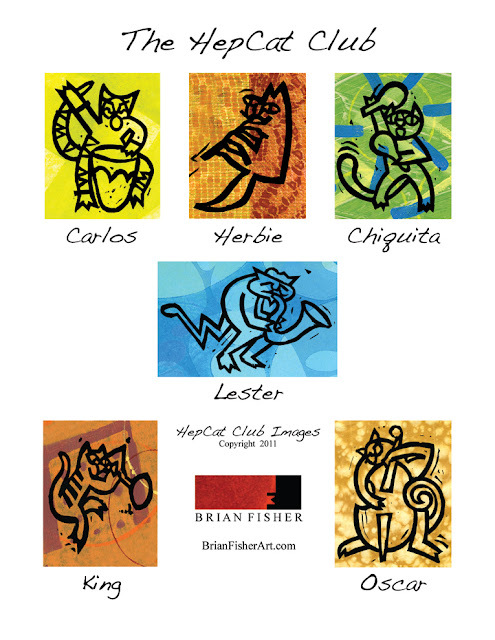 Here are some of my HepCat Club boxed card sets they will be selling. The images were inspired by jazz and bebop musicians like Oscar Pettiford, Herbie Mann, Carlos "Patato" Valdes, Lester Young, and Joe "King" Oliver. I grew up listening to King Oliver. My Grandpa Ed had a great Victrola in his billiard room. While we grand kids abused his pool table we would listen to records like Wille, the Weeper.